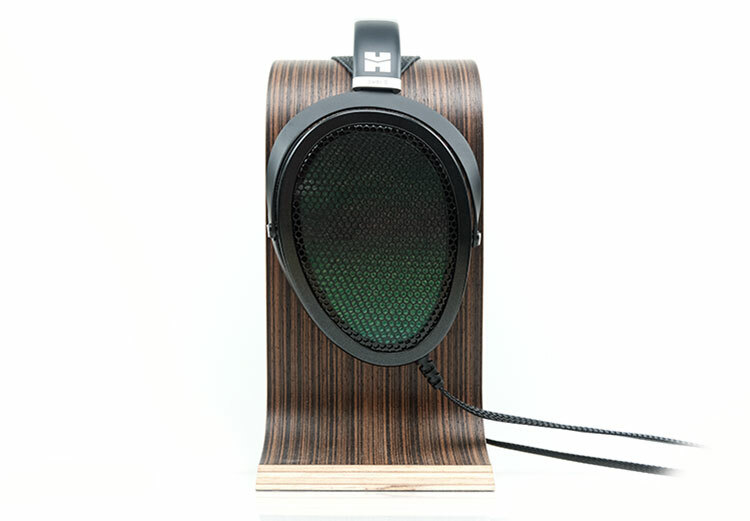 Disclaimer: The Hifiman Jade II was sent to us a sample in exchange for our honest opinion. We thank Hifiman for this opportunity. 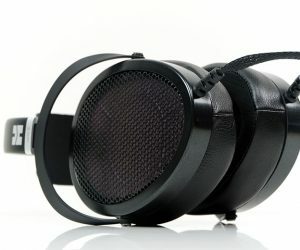 To learn more about Hifiman product reviews on Headfonics you can click here. 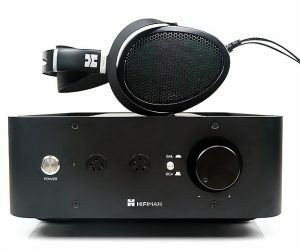 We have an influx of electrostatic (stats for short) product reviews in the coming months and some, or all of it, is from top-tier brands including this one, the Hifiman Jade II. The Jade II is not one but two products that link together as a system; a headphone and a match electrostatic solid-state amplifier. The price of each is mid to slightly high-end but relatively good value for an electrostatic combo. 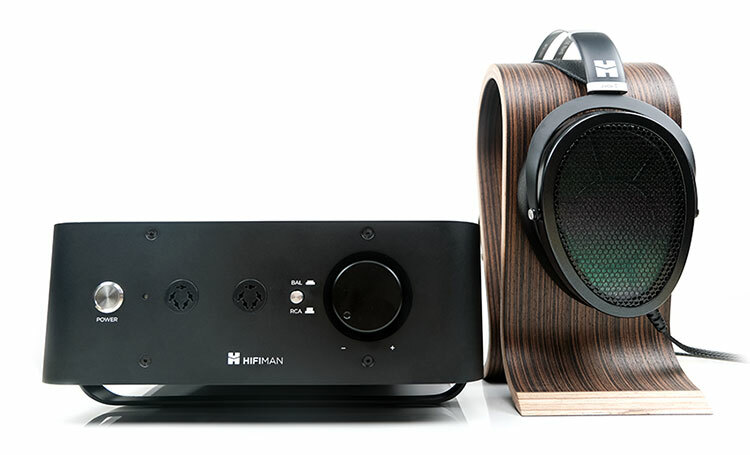 You can buy the Jade II headphone for $1399, the amp for $1399 or both as a system for $2499. Given the Shangri-La is in Orpheus 2 territory for pricing and the Shangri-La Jnr’s $8000 marker beyond most of us, the Jade II represents the most likely stats solution of their range for the majority of audiophiles out there today. Before there was Hifiman, there was HE Audio and the original Jade. Now the original Jade was more of a DIY project according to Dr. Fang Bian and not so much on a commercial level such as we find today with his planar and newer electrostatic models. The original Jade was out around 2007-2008 and ran for about 3 years before being discontinued. 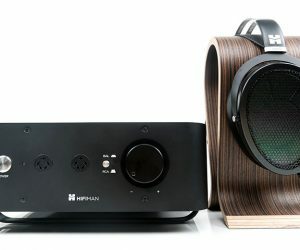 During that time Hifiman came about and the transition to planar magnetic, first with the woody HE5 and then with the classic HE6 was in full flow. It was no surprise then to early fans that Hifiman returned to electrostatic designs a year or two ago with the monstrous Shangri-La and its smaller sibling, the Shangri-La Jnr. Both of which are priced well into the summit-fi territory. 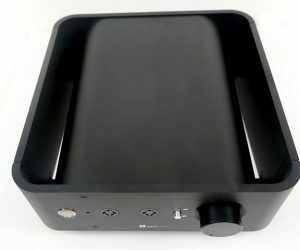 The Jade II brings a lot of Hifiman’s current thinking on electrostatic designs into the realms of ‘affordable’ and as such becomes their entry-level electrostatic headphone and matching amplifier system in 2019. 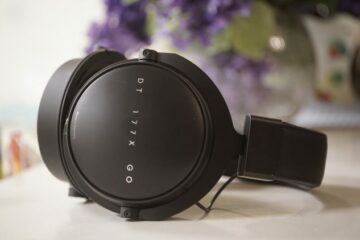 It also affords Hifiman a chance to bring in in their newest design philosophies from their latest range of mid-fi headphones such as the Ananda which I found to be a fairly solid build. 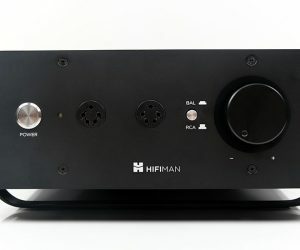 Over the coming weeks, we will actually be speaking to Hifiman in a bit more detail about how they designed the Jade II system and we hope to have that as part of our show report for CanJam Singapore 2019 or in a separate feature just after. Not one but 2 unboxes and if the amp unboxing is what you would expect for an amp then the headphone unboxing is a touch underwhelming. I guess with expectations from previous samples I was expecting one of Hifiman’s lovely little wood display boxes but not this time. Here you get your typical brown courier box but inside its packed with a lot of contoured foam which means the brown box IS the display case of sorts. It does a good job of protecting the headphones but I would have loved to have seen something a bit more refined than a corrugated foam layer. It does follow the same pattern for most Hifiman headphones storage solutions with the non-detachable cable neatly tucked away inside a central aisle and a foam flap covering that aisle. The amp unboxing is equally non-descript but this I find normal for 99% of all amps sent to us. The most important thing to know is that it is well protected with internal foam and comes with a power chord terminated with a plug that matches your country’s power sockets. 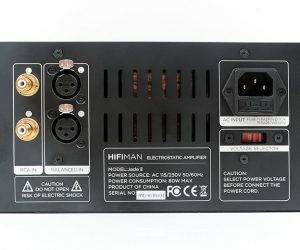 The amp does have a switching power supply at the back so you can adjust it to 110V or 230V depending on your needs. 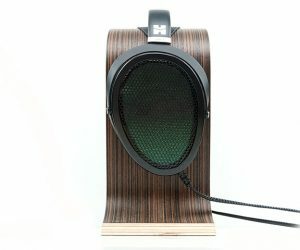 If you have tried the Ananda from Hifiman then the Jade II looks almost the same. Hifiman has done a great job streamlining their design to quite a harmonious level across almost all of their latest releases outside of the Susvara which still uses their previous styling. 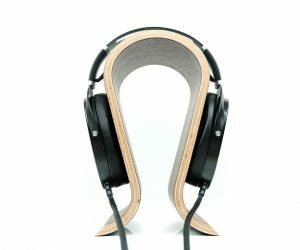 The build is a mix of plastics and aluminum with a spring-steel headband design as well as a pressure balancing leather head strap. 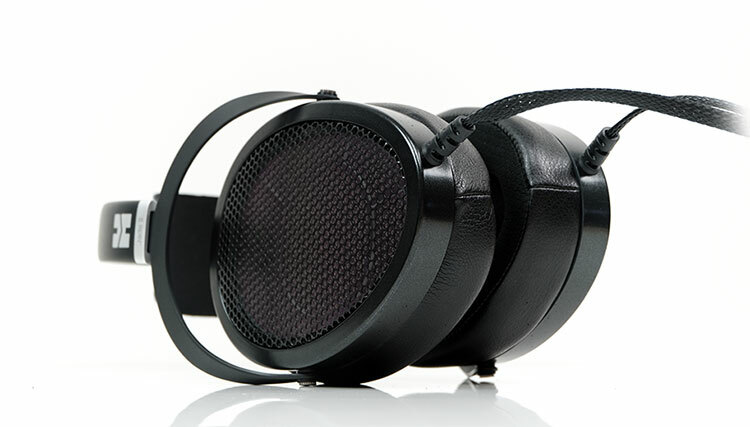 The Jade II headphone also uses Hifiman’s hybrid pads drawn from the HE1K series and certainly a little deeper than the Ananda pads. The headphone is a little lighter also at 365g compared to the Ananda at 399g and our initial impressions of it seem that it is well built with not too many moving parts but also it has that rigidity of the Ananda and Sundara that some are ok with and some are not. 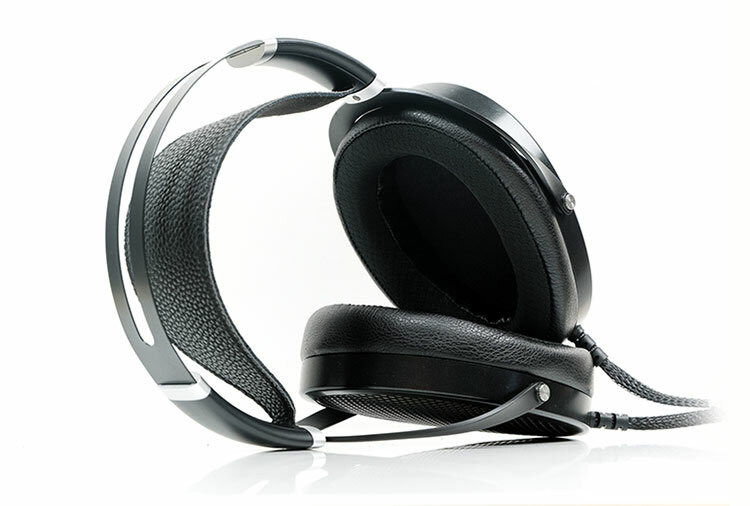 The Jade II headphone lacks that side to side swivel from their previous builds that whilst it cuts down on potential breaking points also lacks a little on its fitting flexibility. I also found the iridescent driver color changes to be a cool design motif on the Jade II headphone. If you can see on the picture above that from a certain angle it has the green hue of the original Jade. However, in the picture below it seems slightly red at a different angle. Neat! I am not initially sparked for joy with the cable. It is a little lighter and thinner than Stax variants but its miles cheaper looking and not as well built as MrSpeakers’ VOCE cable. It is also attached straight down which means it is hitting my collar a bit and yes, it fairly microphonic when that happens. 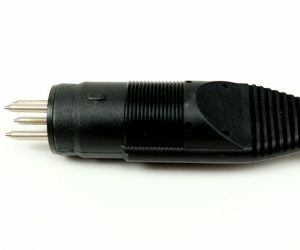 The plug is a pro-bias 5-pin and no issues on the durability of the plug and to be fair the cable has some excellent strain relief and all connection points. The amp design is actually very cool. It is reasonably heavy at 6.5kg and finished in an all matte black paint job. Specs are sparse for now on performance related figures so I hope to get that for the main review. The cool part is that the amp itself is technically a bit smaller than the volumetric size. It is protected in a way by an external metal guard that forms part of the build with a seamless join to the front and rear to allow for all inputs and outputs. To the front, that guard also deploys a raised metal bar at the base to gently lift the main amp off the ground. 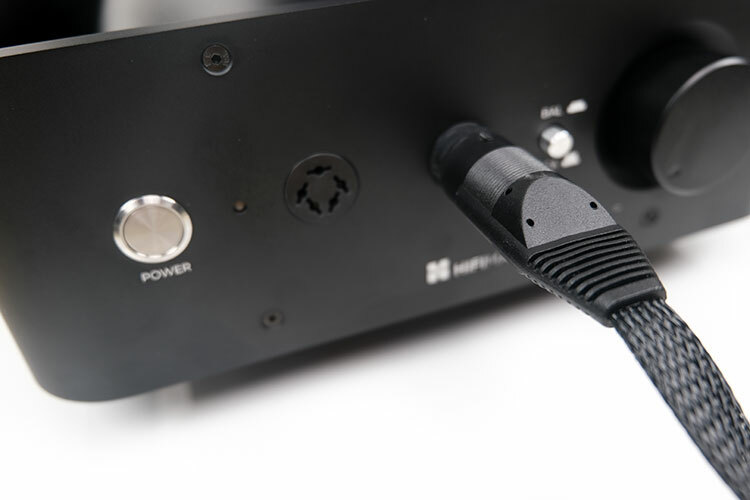 The guard is narrowed slightly to ensure the amp remains perfectly level on flat surfaces. The Jade II amp, as far as I am aware is not a balanced circuit design but can take both RCA and balanced 3-pin connectors to the rear. It also can allow 2 stats headphones to run at the same time from two 5-pin pro-bias sockets to the front. You can choose between a balanced socket source or RCA source meaning you can run two different sources into the amp same time. A little of their EF6 solid state amp thinking in there with the switchable analog inputs. 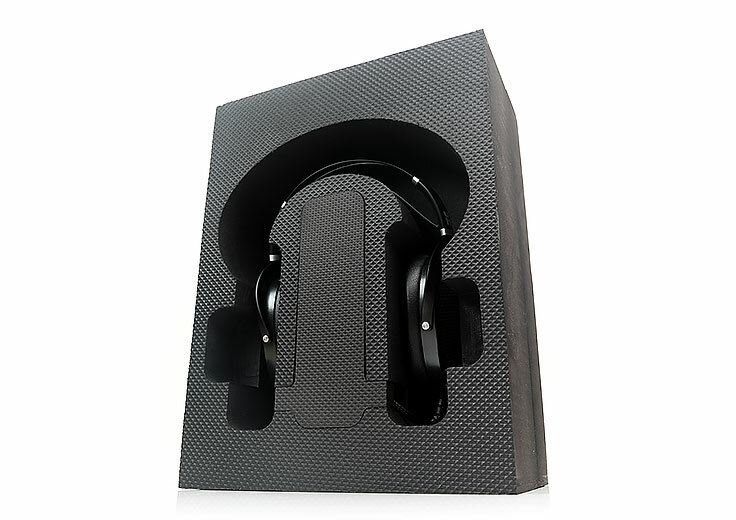 The headphone pulls no surprises in terms of fit and comfort level on initial impressions. It feels almost exactly like the Ananda though maybe a shade lighter. The cups are HE1000 style so they are long rather than wide and the open back design easily fits in my ears with room to spare. In fact, so much so I am almost wondering if there is a sweet spot because I have so much room to maneuver. 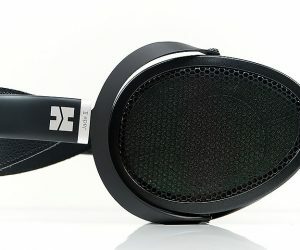 Time will tell if that is true or not but for now, the only minor issue I have is the rigidity due to the lack of side swivel that comes with the new Hifiman headphone frames. The hybrid pads are spot on in terms of comfort and breathability. They look deeper than the Ananda pads or about the same as the HE1000 V2 pads with a slight wedge to the rear. Early days yet with the Jade II headphone and amp but already the sound could be described as relatively neutral and balanced sounding with excellent speed, articulation, and detail. However, the timbre is slightly more on the lean and clean side compared to my own Stax 007 MK2 and not as warm as the MrSpeakers VOCE. Granted, those two are known to be on the bass heavier or the warmer side of electrostatic sound signatures but it does serve as a useful initial comparison. You will get a bit more treble forwardness on the Jade II but after the first few hours, it settles down nicely. It still remains forward but it is not overly sharp or brittle in nature. General midrange timbre also seems quite nicely tuned with a good harmonic balance, plenty of instrumental separation and a very quick turn of pace that really helps with precise and 3-dimensional imaging. Bass is tight but not huge in quantity, at least compared to the Stax 007 MK2 and not as warm as the VOCE either. The VOCE low-end is quite linear but it still has good body and it does help put a bit of meat on the instrumental bone. On the Jade II system, our impressions are of a fast and punchy sound when required but a slightly lighter level of bass body compared to those 2. The amp is as about as solid state as you can get in terms of a sound signature with a fast, punchy and precise sound that err’s a little to the dry side with a slightly bright upper register. It actually sounds very good with the MrSpeakers VOCE and Stax 007 MK2 and there does not seem to be any lack of power either. Just as a quick test we switched all the headphones to the Enterprise Lite E tube stats amp and the Jade II headphones did sound wetter with a bit more body in the lower-mids. Treble also sounded a touch smoother as well. Quite an impressive pairing overall. As ever our initial impressions are likely to change over the course of our full testing but one thing did get me thinking. 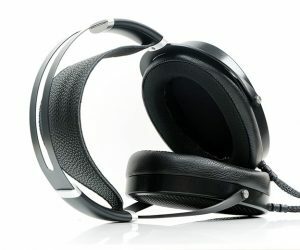 An electrostatic headphone and a powerful enough matching amp for $2499 compared to a $2999 HE1000 V2. Now there is something worth thinking about because I think outside of the slight lack of low-end depth the Jade II might give the HE1000 V2 a good run for its money and come in at $500 less. Of course, there is no need to take the amp, you can just have the headphones if you already have a decent electrostatic amp and I think this is where we will focus on also in our main review. 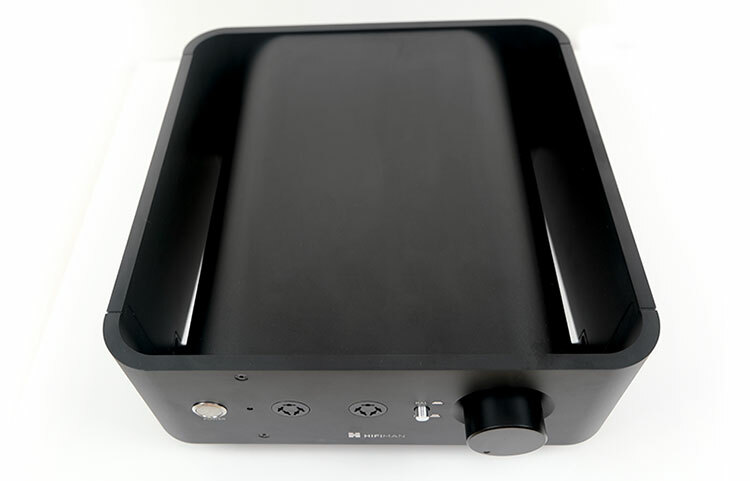 I am quite curious to see if the Jade II amp is responsive to different DACs as well as comparing to other amps. Stay Tuned!